Whether an enthusiast caring for the finest blade or a straight razor user demanding a comfortable shave, the Naniwa Prosfessional 10K stone (formally called the Chosera 10k water stone) is a premier stone which produces premier edges. Naniwa recently changed the name but these are the same stones from their top of the line series that are renowned for working quickly with great feel keeping sharpening sessions quick and satisfying. Cleanup and use are sped up thanks to splash and go convenience. Extended soaking is discouraged by Naniwa due to the composition of the stone. The Pro/ Chosera 10k is hard and wears slowly helping to maintain a trued surface for honing and providing for extended stone life. 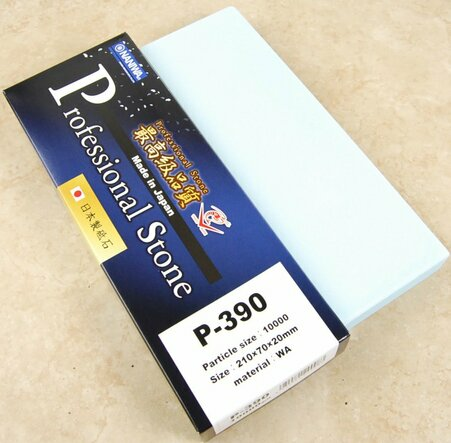 The 10k stone measures 8 1/4" Long x 2 3/4" Wide or 210mm x 70mm x 20mm. Just as good as I expected. This stone is fast cutting and creates a great finish. I am using this on Aogami blue steel. I have confidence it will work on my VG-10 blades also. It is a very hard stone yet it polishes it is thicker than a standard Chosera probable 15% since it is an occasional stone unless it is used to sharpen razors daily it is likely to last many years .Dishing is minimal since the stone is so hard many high grit stones are soft it also means that you can work quickly on it without fear of cutting into it .Well worth the money especially from CKTG. Fastest cutting 10K stone I have ever used. This super hard stone is one my top finishing stones. This is the best stone made. The only way to better it is with natural stones at two and three times the cost. This is hard, smooth and easy to use. Great edge! Great finish! CKTG is at heart a small business so the service is personal. They are one of the rare companies that actually dispatch the order the same day as receiving it and provide tracking information. It is great to deal with an individual by name and it�s evident that they take pride and love in what they do. Had a problem with one of the products and they went out of their way to resolve. I would highly recommend dealing with this company. It�s nice to find a company who cares and they will get me as a return customer. Mark is great at answering questions for knife nuts of all levels. His service is second to none. Really appreciate the time he puts into every email as well as the free forum he hosts. Great experience working with Chef Knives to Go. Quick delivery, and they are great about returning emails. I'm actually waiting on my second knife from them. I'm sure there will be more to come. Loved the instructional videos on the website. Great service and quick shipping. Best selection of Japanese knives around. I recommend this site to all of my fellow culinary professionals! Top quality service. None better. Always the best. Quick shipping, description matches what is delivered and the price, you can't beat them. I always come here to order anything I might need for the kitchen and I am never disappointed. I ordered several Christmas presents from Chef Knives To Go. Everything arrived as promised and all who received gifts from there were happy with them. As always, the shopping experience at Chef Knives to Go was excellent. Fast, free shipping, great website description of the product, and the confidence instilled in me because I know that if there are any problems the good people at Chef Knives to Go will help me work it out. My go to company for kitchen gear. Awesome selection of knives and tools. Super fast shipping. Never had a problem and questions about all products are answered quickly. Great customer service. Yaxell Dragon Fire BD1N Boning Knife 6"